Are your valve adjuster screws galled up and worn? These are the perfect replacement. Made in Germany, these hardened valve adjusters are the best quality on the market. They are the standard 8mm size. Don't forget to order new nuts, too! HD Chromoly Retainers are an excellent choice when running HD valve springs, and absolutely a must when running dual springs. Norris single HD valve springs with spring dampeners are an excellent choice when a lightweight valvetrain is in order and longevity and reliability are of utmost importance. Manton Chromoly Racing Pushrods MADE IN USA, .035" Manton Chromoly Racing Pushrods MADE IN USA, .058"
Chromoly pushrods offer far greater performance potential than stock. These MADE IN USA Heavy Duty chromoly pushrods weigh just 68 grams (uncut). These quality push rods will work well for your stock or mild performance aplication. Sold in sets of 8. 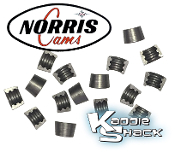 Replacement Adjustable Rocker Screws - sold each Rocker Arm Shim Kit 0.010” 8pcs. Replacement adjustable rocker screws for EMPI 1.25 and 1.4 rocker sets. Sold each. Rocker Arm Shim Kit 0.015” 8pcs. 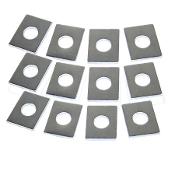 Rocker Arm Shim Kit 0.030” 8pcs. Rocker Arm Shim Kit 0.060” 8pcs.